Inventory Tax is a property tax imposed on the dealership that is charged on the price of each vehicle sold. The tax rate is assigned to the dealership by the dealership's county of residence. The inventory tax is remitted monthly to the county tax office by the 10th of the month with prepayment of the taxes. The dealer has to pay the tax whether or not the customer is charged. 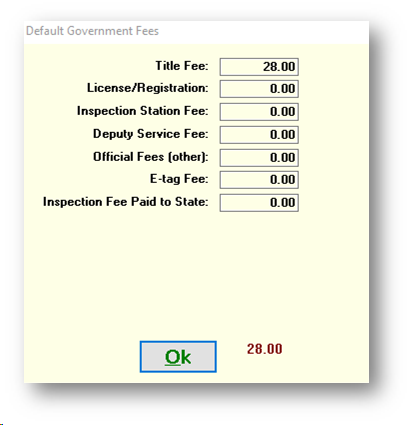 A new dealer starts without a rate for the first year and does not owe the tax, however, the dealer is still required to file the Inventory Tax Statement with the county. To enter or update the current Inventory Tax rate, go to Miscellaneous >> 1 - System Options >> 3 - Taxes. Enter the decimal equivalent of the % given by the county. Frazer will remove the first two zeroes after the decimal point. There is also a default option to bill the customer for the tax in this options screen or this option can be selected on a per deal basis. Frazer will automatically record inventory tax when it is required for the sale, using one of four possible designations: MV, FL, DL, or SS. Inventory Tax is collected only for the MV designation, whether or not the customer was charged. A regular motor vehicle inventory sale. Inventory tax is collected. Five or more motor vehicles sold to the same buyer within one calendar year (Fleet Sale). There is no inventory tax. A wholesale deal. There is no inventory tax. When a vehicle more than once in the same calendar year, there is no inventory tax for the 2nd sale (Subsequent Sale). ** Sales to Mexico are still subject to VIT. If the customer's license is listed as a Mexican Passport, the type of sale will be printed as "MV". If the address of the customer is listed as Mexico, the type of sale will be incorrectly printed as "export-MX" instead of "MV". Regardless, as previously stated, the sale is still subject to the VIT. There are no exceptions for exporting vehicles out of the state of Texas. To print the actual Inventory Tax Report, go to Reports >> 2 - Sales Reporting >> 6 - Inventory Tax Report. 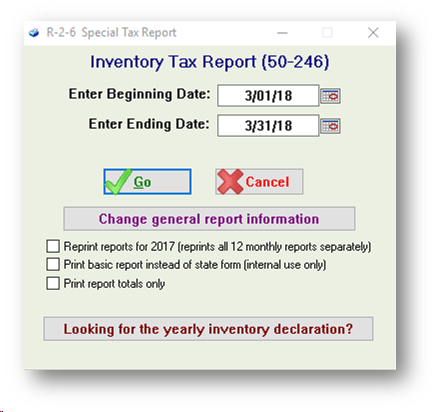 If the report has not been generated previously, a screen will automatically appear where Inventory Tax Statement Information is entered. Fill in the information and Save. Enter the date range desired. The program will automatically default to the previous month unless changed. Click on . There is no print preview for the report - it will simply print to the white paper printer. 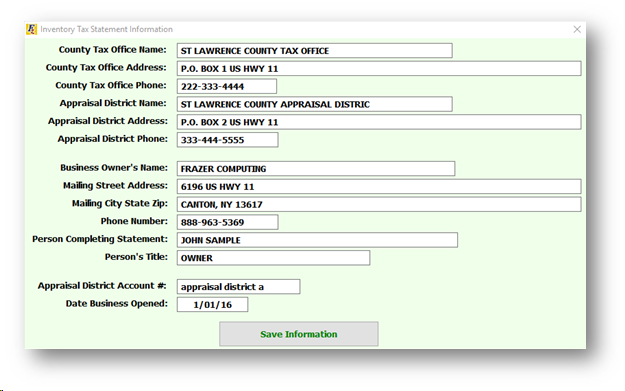 To see a preview of the data, either check the box to "Print Report Totals Only" or check the box to "Print basic report instead of actual form." For BH-PH sales in which you remit your sales taxes to the state on a deferred basis (once a month based on payments received the previous month) you are not allowed to charge interest on sales taxes. However, when you print your contracts the sales tax is included in the "Amount Financed" section creating a second "effective" APR that must be disclosed in the Federal Regulation Z box. You will then have two APR's associated with these deals - One is the APR that you enter and that is used to calculate financing (but not on the sales tax) and the second is the effective APR based on the sales tax being included in the Federal Disclosure box. It is important that you have the first APR to be able to prove that you did not charge interest on the sales tax.